When we discuss furnished City residences Frankfurt, we are focusing mainly on the interiors. They are usually fully furnished and equipped with a complete household, to bed linen and towels. Another advantage is its own kitchen having dishes, microwave, toaster, coffee maker, washing machine, DVD, TV, stereo, etc. This makes you self sufficient and your eating habits won’t suffer in any way. Most apartments are spacious so you can have a work station all set up to work from home. The location and the Bornheimer Landstrasse offer 1-3 bedroom apartments and very good transport links. 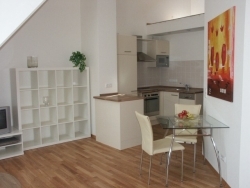 This popular residential area Freiligrathstraße offers beautifully furnished 2 bedroom apartments. Today we are going to give you more info about our Downtown Frankfurt residence. The inner city Frankfurt residence offers exclusive one-, two-and three-bedroom apartments in the City of Frankfurt. It is located in the Kleine Hochstraße, which is a side street of the Fressgass, very centrally located. Our apartments are stylishly furnished, have a kitchen and a French balcony. Between the main station and the Konstablerwache is the Zeil, which is regarded asGermany's busiest shopping street. Here you will find shopping malls, department stores and restaurants. Goethe Street, which is one of the most expensive shopping streets inGermany, has designer boutiques and jewellery stores.